Alberta’s newest solar program will help schools across the province cut electricity costs, reduce emissions and expand environmental knowledge. Minister Phillips, Minister Eggen, MLA Annie McKitrick and MLA Chris Nielsen join students and faculty from Archbishop O'Leary High School to announce a new solar program for schools. The Government of Alberta is investing $15 million from the Climate Leadership Plan to install more solar panels on schools. The Solar for Schools program provides funding to install rooftop solar panels with rebates of up to $1.50 per watt on the solar energy generated to offset the school’s energy costs. The Solar for Schools program also includes an educational component, so that students and teachers can learn more about climate change and renewable energy technology. The Solar for Schools program will be available to public, Catholic, francophone and charter school authorities for schools that have not received Alberta Education’s Solar Technology Systems grants. The Solar for Schools program will be run by the Municipal Climate Change Action Centre, adding to the wide range of existing solar incentives available and helping meet the growing demand from existing schools for solar funding. The solar industry has grown by nearly 500 per cent over the last three years, with installed solar capacity rising from six MW in 2015 to 35 MW in 2018. "Community schools are the ideal place to model renewable energy generation and energy conservation measures. 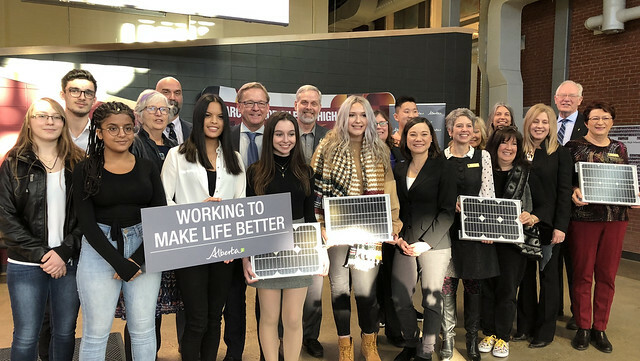 The Solar for Schools program is an exciting initiative and we applaud the government for taking steps to support energy education at the community level, where all Albertans can benefit. Students can get inspired about the future, and neighbours of all ages can see the technology in action – learning about energy systems and the role each one of us plays in making our communities more sustainable for future generations." The Municipal Climate Change Action Centre, a partnership between the Government of Alberta, the Alberta Urban Municipalities Association and the Rural Municipalities of Alberta, is responsible for funding, technical assistance and education to Alberta municipalities in addressing climate change, and will administer the Solar for Schools program. Increasing the amount of solar energy generated by schools supports Alberta’s target of 30 per cent renewable electricity by 2030 by helping Alberta transition to an electricity system that is cleaner, reliable and more sustainable. School authorities will be able to apply for grants as of Nov. 28 on the Municipal Climate Change Action Centre’s website. The Government of Alberta has funded solar installations at 83 schools – new schools, replacement schools and school modernizations – across the province since 2015. Decisions to install solar energy systems are made by schools and school authorities. Energy Efficiency Alberta’s Business Energy Solutions Program has also supported 84 schools with energy upgrades and retrofits, providing more than $800,000 in rebates.